We ask you what tapa would you make with Palacios chorizo slices, and the answers have been so interesting. Congratulations to the lucky winners! We'd like to thank all participants. If you're one of the winners, you´ll receive a private message on Facebook asking you the following information: full name, postal address, e-mail and telephone number, in order to receive the basket of Palacios products. List of winners of a basket of Palacios products! 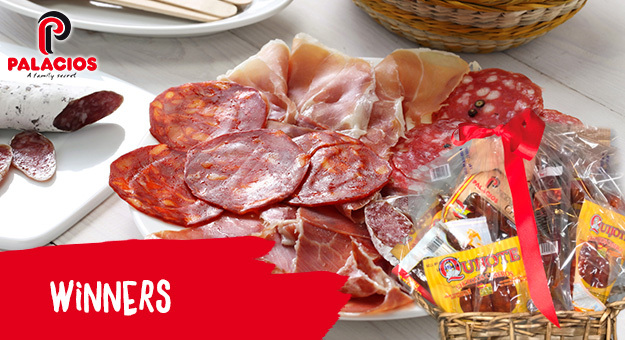 We're giving away 10 party tray baskets for chorizo lovers! We're giving away 10 Palacios baskets for chorizo fans! We're giving away 10 Palacios baskets for chorizo lovers! We're giving away 20 baskets of Palacios products! Winners of the 20 Palacios Party Tray baskets! We're giving away 20 Palacios Party Tray baskets!